SLS Curve 165 LED Lighting Profile. 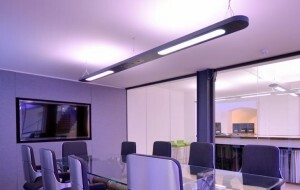 1500mm Wire suspended lighting profile engineered in flat extruded aluminum complete with rounded ends. A 1200mm cut out machined with curved ends to match and fitted with a low energy 18W RGB LED fixture hidden behind a low glare control optic which offers minimal light loss. The office or meeting room, reception desk, classroom or boardroom can now come to life with the introduction of controlled – coloured light into these spaces. By utilising the amBX Light-Scene Engine which offers multi-room control of many white light scenes including warm white, cold white, apple white, rose white as well as any other colour in the spectrum, perfect for setting the mood/scene with the right colour. The lights can even be set to automatically come on at the desired time and go off at a set time too.